(File Photo) A.J. Fenske had the winning discus throw and finished fourth in the shot put at the Bolivar HS Relays. 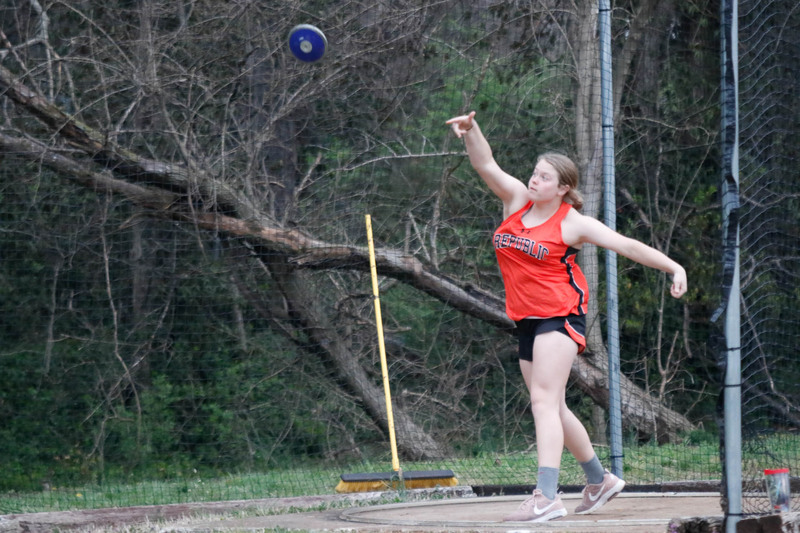 The Lady Tigers track team finished third at the Bolivar High School Relays Thursday. Three Republic athletes won individual gold medals: Lauren O’Hara won her second long jump competition of the week; A.J. Fenske won her first varsity event championship with a winning throw in the discus; and Jazzy Kirby won the 800m run. Aaliyah Vasquez turned in her best finish so far in the triple jump, finishing second. Kaitlyn Ragsdale finished second in the 100m dash. In the 400m dash, Republic took three of the top four spots. Jasmyn Douglas finished 2nd, Vasquez was third, and Eternity Knotts finished fourth. Mihane Nambara finished third in the 800m run. Ragsdale took third in the 200m dash. And in the pole vaule, Reese Watkins finished third, followed by Alexandra Reeves in fourth. Other fourth-place finishers for Republic were Fenske in the shot put, Nambara in the 1,600m run, and Knotts in the high jump. See all of Republic’s results here.